Today's Draw: The World in the What to Do Next in Regards to My Goal position from the Tarot of the Sidhe and the Deck of 1000 Spreads. Do you feel you fully celebrate your successes? Or are they just a blip on the radar of your busy life? Do you ever just stop and give yourself a good old pat on the back? So today I used the same Deck of 1000 Spreads technique of creating custom spread positions that I used yesterday. 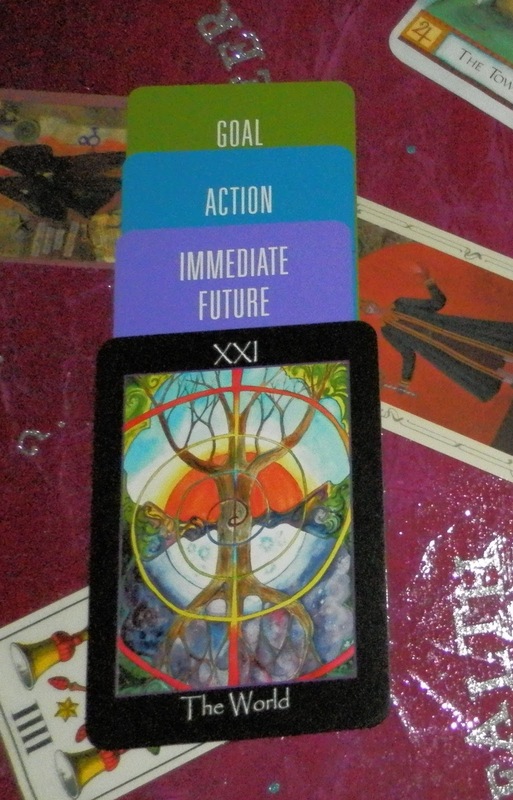 But I also did something I'm not sure I've done intentionally in the nearly three years I've been writing my daily posts: I drew a card specifically for me to explore what to do next now that my deck is out. See, the Deck of 1000 Spreads wasn't a destination for me. It was never been intended to be one. The "destination", as many of you know from reading this blog, is to be a spiritual/self-help type of writer, dispensing the kind of insights I deliver here each day. While on that road I got this phenomenal idea for a product serving the tarot world and I HAD to do it. And doing it was divinely inspired, not only because it has been such a gift for me so far, what with all the positive feedback and the things people are doing with it. But also because of something that became clearer to me just the other day. OK. I'm going to brag. Facebook people are probably sick of hearing this...haha. But I haven't told the people who just know me from my blog. For the past week or so, the Deck of 1000 Spreads has been a best seller in the Fortune Telling category on Amazon. It's been anywhere from #1 to #7 when I've checked. It moves around a lot. At the time of this writing, I'm #1 in Fortune Telling, #4 in Tarot, #15 in Divination and I'm really nowhere near the Top 100 in the New Age category (the next level up). Yet. Haha. But I'll tell you this much—none of this was on my radar a month ago. These rankings never occurred to me. Now that I've seen them and the little outline that goes along with the photo here, it occurs to me that I'm already writing in the category I want to: Religion & Spirituality. I'm a few levels deep into it, but I'm already in it. And this fills me with hope that I will be able to achieve my dream of being a mainstream spiritual author and helping and healing people with my words. I think I do that now here and feel very blessed by it. Do you know I've been operating this site for more than two years and this summer will mark three years of daily posts I've been making and I've never once heard a negative word about what I do? I mean, there are critics everywhere in life, but I've been so blessed to hear only words of support from you. I'm getting all emotional just writing this. But this has been such a gift because I get such great feedback. AND I share some stuff that makes me uncomfortable admitting from time to time, and it's such a safe place. On my blog and on Facebook, this post has been a safe place for anyone who has ventured in. Anyway, to get to the actual reading we're doing today, the rest of my week is slow in my actual job. So I have a couple of days of lull before I get busy again next week. And I want to continue this momentum that seems to be building over my deck and ride it into my next project, which I'm thinking right now might be a few ebooks adapted from this blog. Over the years people have asked me to put it in ebook form, but I can't take the tarot with me in ebook form, primarily for copyright purposes...I can't print cards from all these different decks in a money-making venture without getting permission. So anyway, that's what today's draw is all about. What should I do next to reach my goal? And The World is telling me to tie up loose ends first. To integrate the experience I've been having. My deck has been out in the world for, like, two weeks...haha. I can keep enjoying this fun for a little while longer. Like, I haven't even drunk a toast to this release or had a "me" day to celebrate. And that's so typical of me. I'll wallow for weeks in my failures...haha...but I feel bad bathing in my successes. And, when you think of it, that's just not the way to live. We should forgive our failures and celebrate our successes, instead if the other way around. So I think The World is telling me to do just that...to do something to synthesize this moment it before I take the next step.